US Sec. 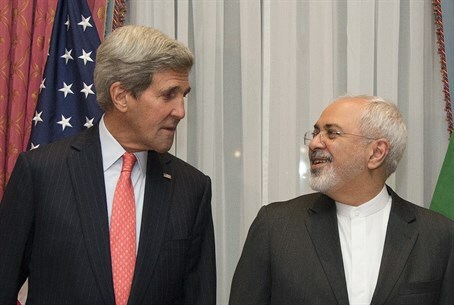 of State John Kerry meets Iranian FM in Vienna, as June 30 deadline for final deal looms; French FM pessimistic. US Secretary of State John Kerry and Iranian Foreign Minister Javad Zarif have launched their final round of negotiations over Iran's nuclear weapons program, just two days ahead of the deadline to reach a final deal. The two leaders met in Vienna Sunday, and are to be joined by several other foreign ministers later on in the day, for what is their third meeting since Saturday, according to Reuters. It comes as further doubts are being raised as to the viability of reaching a deal curbing Tehran's nuclear weapons ambitions by June 30, the date set for Iran and the major powers to sign a final agreement based on the framework deal reached in April. As that deadline looms, pressure on the Obama administration is increasing, with an unprecedented open letter from 18 leading foreign policy experts - including five former top Obama administration officials - criticizing the White House for negotiating a "bad deal." Meanwhile, on Saturday French Foreign Minister Laurent Fabius outlined France's three key conditions for signing a deal - none of which Iran has met so far. "What we want is a robust deal that recognizes Iran's right to civil nuclear power, but guarantees that Iran gives up definitively the nuclear weapon," the French minister said. "For this there are three indispensable conditions: a lasting limitation of Iran's research and development capacity, a rigorous inspection of sites, including military if needed, and the third condition is the automatic return of sanctions in case it violates its commitments," he added. An on Friday, a senior Western diplomat said that major differences remain between Iran and world powers on several key issues. "The questions of access and transparency, PMD (possible military dimensions) and sanctions remain extremely problematic," the diplomat said. "We can find an agreement on some points, but on major issues there are still big differences." Fabius has previously cited as a major point of contention an Iranian demand for a 24-day warning prior to nuclear inspectors arriving at sensitive sites, dismissing the demand by noting that "a lot of things can disappear" in 24 days.